In his lecture 'The Relations Between Poetry and Painting', poet Wallace Stevens, asserts that there is "a universal poetry", of which literary poetry and painting are manifestations. Art and composition are one; poetry and painting alike created through composition. "Where the poet does his job by virtue of an effort of the mind he is in rapport with the painter, who does his job with respect to the problems of form and colour." Artists have become writers and writers have become artists. I've been an artist in the past, not an especially good artist I have to say, but I enjoyed the process. I was a very mathematical artist. I measured things. I worked on paper first, transferred the drawing from paper to a Daler board using carbon paper, inked in the outlines and then filled in the blanks with oil paint using the tiniest of brushes, an 0 or an 00, and even tinier amounts of paint which I worked into the board carefully. A single A4 sized painting could take me 6 months. Only two have survived I'm afraid. My wife had them framed a few years back and they hang in our living room. Robert Creeley has said that presenting people with both poetry and visual art "shifts the emotional centre." Speaking of artist Francesco Clemente, with whom he collaborated, he said, "Any person reading what I've written and seeing what he's made is moving back and forth between two emotional fields." He went on, "It's not a question of understanding the paintings, but of picking up their vibes – more like playing in a band." When I made my paintings – and it's over twenty years since I've had a brush in my hand – I considered what I was doing as a completely separate thing to my writing. I had never considered that art might have anything to do with writing. Even now, older and supposedly wiser, I still struggle with the notion. It's an oil and water thing. Oil and water don't mix but oil can make some pretty shapes floating around in water. Anyway, I've been thinking about the relationship between poetry and art for some time so I thought I'd do some investigation and the following, which will run over three blogs, are the results. Poets and artists have bummed around together for years. It's not as if we have different tables in the café. "Oh, sorry, you can't sit here – this is the artist's table." 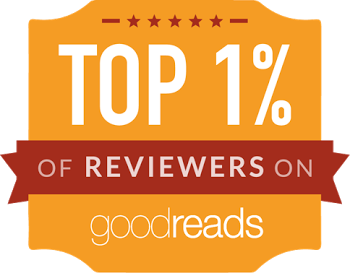 We're all after the same thing, to provide a reader or a viewer an opportunity to interact with a part of us. The New York School poets and painters shared a social scene and a community, appearing frequently in each other's work and letters, reading together, working on literary journals, and becoming champions of each other’s poetry and artwork. We were all in our early twenties. John Ashbery, Barbara Guest, Kenneth Koch, and I, being poets, divided our time between the literary bar, the San Remo, and the artists’ bar, the Cedar Tavern. In the San Remo we argued and gossiped: in the Cedar we often wrote poems while listening to the painters argue and gossip. So far as I know nobody painted in the San Remo while they listened to the writers argue and gossip. It's all very understandable. Poets write about what's going on around them. And artists draw and paint what they see. It must have been the most natural thing for them to make art (both written and visual) out of their parties, squabbles, affairs and booze-ups. I get that but there were no sardines in any of my paintings; in fact my paintings were devoid of meaning. I admit that quite happily up front. I was not an artist in the purest sense of the word. Oh, I have an eye – that I am happy to admit – but no real ability. What I did was techie drawing coloured in. And yet there have been so many times I wished I could pick up a piece of paper and a pencil and words NOT flow from it. Beckett, of course, maintained lifelong friendships with a number of artists; Louis le Brocquy, Avigdor Arikha and especially Jack B. Yeats spring to mind but there were others. Ever since people have written about Beckett they've noted that he's a writer who is, even more than usual, interested in images. In his biography of Beckett, James Knowlson writes that, according to Arikha, Beckett "could spend as much as an hour in front of a single painting, looking at it with intense concentration, savouring its forms and its colours, reading it, absorbing its minutest detail." Similarly, in 1951, poet Frank O’Hara got a job selling postcards at the gift shop of the Museum of Modern Art in New York City – simply so he could have access to the paintings; he often wrote poems while he worked at the counter, and his friends in the art world often stop by to visit; in time he actually worked his way up to the position of associate curator. What I feel he gets so well, dispassionately, not tragically like Watteau, is the heterogenicity of nature and the human denizens, the unalterable alienness of the 2 phenomena, the 2 solitudes, or the solitude and the loneliness, the loneliness in solitude, the impassable immensity between the solitude that cannot quicken to loneliness and the loneliness that cannot lapse into solitude. 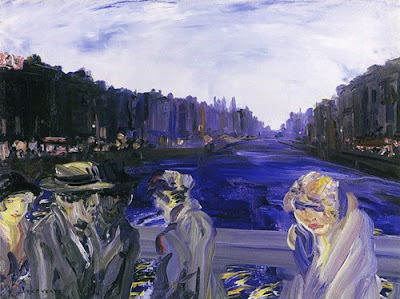 It's doubtful that Yeats would have seen this in his own work and equally unlikely that this was in his mind as he painted but this solitude is what Beckett saw and went on to extend to the humans in his plays and novels. I have to admit that, although I have a great love of art, I've never known any artists. I spent a few hours with a printmaker in Aberdeen – much to his annoyance I'm sure – and watched him work but that's about it. Actually, that's not true, Margaret, one of my friends' mums was an artist, but I never even saw any of her pictures until I knocked on her door to tell her my mum had died and art wasn't really on my mind right then. The painters I appreciate the most are Magritte and Hopper. 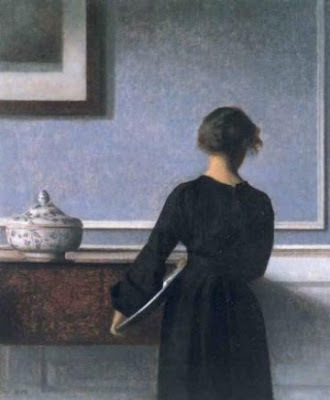 There was a documentary on BBC4 a wee while back where Michael Palin investigated the life of the Danish artist Vilhelm Hammershøi and I was totally bowled over by his work. But I've never been so moved by any painting that I've felt the need to put my feelings into words. When you think of an artist's response to a work of art probably the first thing you think of is 'Ode on a Grecian Urn' by John Keats. Its inspiration is considered to be a visit by Keats to the exhibition of Grecian artefacts accompanying the display of the 'Elgin Marbles' at the British Museum. and Anne Sexton's 'The Starry Night' based on Van Gogh's painting, coincidentally also the inspiration for Don McLean's song 'Vincent (Starry, Starry Night)' (which a few weeks back I mistakenly attributed to Leonard Cohen). One poet who has made a practice of writing poetry about specific works of art is Mark Young. He runs a blog called mark young's Series Magritte where he regularly presents us with a painting by Magritte (and there have been one or two I wasn't familiar with) coupled with a poem about the piece. William Carlos Williams wrote a whole book of poems about an artist, Pictures from Brueghel and Other Poems. It has its own website. Brueghel's an interesting choice for Williams who regarded himself as a Modernist first and then a poet. Like Beckett, Williams was one who celebrated Modernism, but both artists could be inspired by the old masters. In Williams' case, Brueghel, da Vinci, Dürer, Botticelli, Bosch, El Greco and Gauguin; in Beckett's Poussin and the Dutch masters of the Golden Age, and of course Caspar David Friedrich. Williams himself took every opportunity to remind his audience that he worked across boundaries: "For poet read – artist, painter." 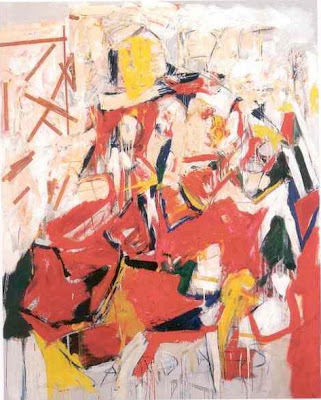 Williams thought about the creative process in painterly terms, and he asks us to experience the work as we might experience a modern painting: "There is no subject; it's what you put on the canvas and how you put it on that makes the difference. 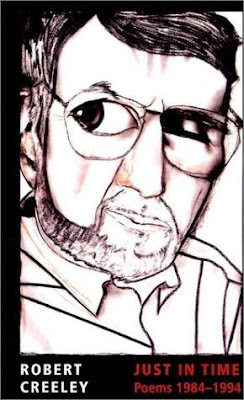 Poems aren't made of thoughts – they’re made of words, pigments put on ..." In an interview with Walter Sutton, Williams said explicitly, "I've attempted to fuse the poetry and painting, to make it the same thing." Like Beckett many of Williams' closest friends were painters and/or collectors, and although he kept a safe distance from Greenwich Village, he made regular weekend visits, frequenting the informal salons of Alfred Stieglitz, Walter Arensberg, Alfred Kreymborg, Man Ray, and others. (See William Carlos Williams in a World of Painters by Bonnie Costello for more information). Everyone knows Waiting for Godot but what a lot of people won't know is that the inspiration for this great theatrical work was a painting. 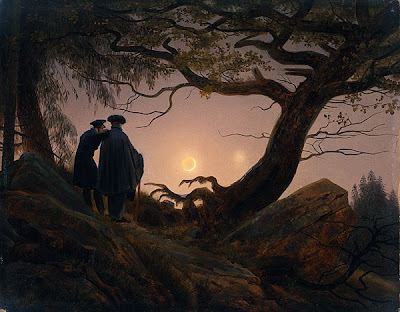 Beckett told Ruby Cohn that he had remembered a Casper David Friedrich painting, 'Two Men Looking at the Moon', which he had seen during his trip to Germany prior to World War Two and had adapted this image, staging it in En attendant Godot. I've mentioned poets up till now but other writers have also been inspired by art. My wife's longevity-enhanced, blind traveller, Blind Carbon Copy, was created first but as soon as Carrie saw Picasso's painting 'The Man with the Blue Guitar', he came to represent the character from that point on. 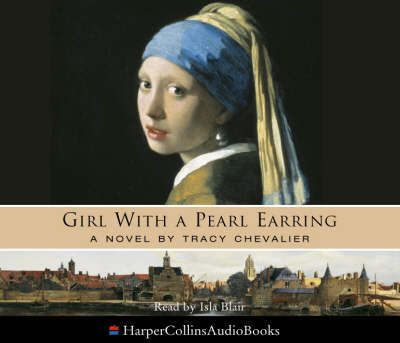 Better known will be Tracy Chevalier's novel Girl with a Pearl Earring inspired by the painting by Vermeer. Susan Vreeland's 1999 novel Girl in Hyacinth Blue, was also inspired by a Vermeer painting, 'The Passion of Artemisia'. It sounds Greek so it probably is Greek. In his book, Museum of Words: The Poetics of Ekphrasis from Homer to Ashberry, James A. W. Heffernan states that ekphrasis is “Composed from the Greek words ek (out) and phrazein (tell, declare, pronounce), ekphrasis originally meant ‘telling in full.’"
We're told by historians (who supposedly know about these things) that dating back to the 4th century school boys were taught to write poems about the architecture, museum art, grand public places and everyday objects such as goblets, urns or vases – for the benefit of those citizens who had little access to them. I'm not sure which citizens wouldn't have access to urns and vases but I'm just reporting what I read somewhere. The point to this kind of poetry, which is probably why it's often used in schools to introduce children to poetry, is that you are not being asked to describe the work of art in question but how it makes you feel; it's a response to the art, as if you've entered the work rather than simply observed it. Write about the scene or subject being depicted in the artwork. Write in the voice of a person or object shown in the work of art. Write about your experience of looking at the art. Relate the work of art to something else it reminds you of. Imagine what was happening while the artist was creating the piece. Write in the voice of the artist. Write a dialogue among characters in a work of art. Speak directly to the artist or the subject(s) of the piece. Write in the voice of an object or person portrayed in the artwork. Imagine a story behind what you see depicted in the piece. Speculate about why the artist created this work. 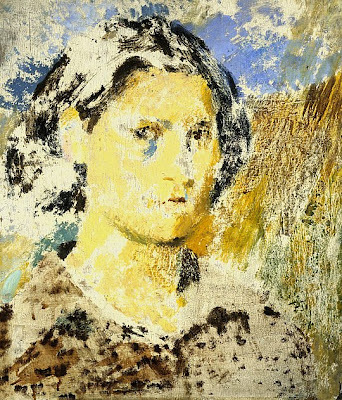 Lisa Rhody—who was at the time calling herself “Calamity Jane” and was working towards her Ph.D. at the University of Maryland—has put a lot of effort into laying out Conventions of Ekphrasis. They're worth having a look at and the comments are intelligent too. An interview with the poet, Jennifer Bosveld about how she goes about writing ekphrastic poetry is also of interest. I'll leave you with Jennifer Bosveld's poem 'Man and Dog'. I did look for an image of the poem that inspired this online but I drew a blank and I wonder if this weakens the poem any? I'm not familiar with the artist so I can't even guess how he would portray a man and his dog. Any thoughts? Painters seem to have a death grip on the word artist, but it really applies to anyone who is a cultural historian. The mediums are different, but anyone who challenges the senses is an artist: painters, sculptors, chefs, poets, writers, musicians. The word is even used as a synonym for excellence. 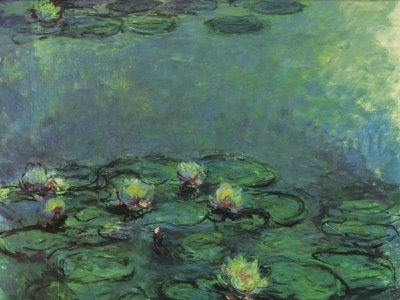 It makes me think that art is the awareness of human depth and potential. In its many forms is captures our moments in a vision, word, or taste. Great post. I always enjoy learning more about the people behind the works because it helps me appreciate what they do more. I enjoyed how you developed the piece. Its easy to see why you like Magritte ... His work is a beautiful example of visual poetry ... truly a mix of the two ideas -less meter. Good point, Greg, all poets are writers and all writers are artists – we really have far more in common with each other than we have differences. And we feed off each other too which is how it should be. Enjoyed your take on the Frank O'Hara poem, Sharon - still can't see the sardines mind. And, Kaz, yes, Magritte. He's really quite the opposite of everything my writing aims to be – the items in the painting don't go together and the title doesn't go with the picture and maybe that's the thing that keeps me hooked, the need to make sense out of all of this. Love your fractal site by the way. In my experience, the (false?) separation between the arts is mostly maintained by those who only work in one channel, and have no experience (or desire to) in other channels. Most artists could learn a lot by walking in another artform's shoes for awhile. It would do a lot to loosen up the pretentiousness that is often a defensive mechanism against self-esteem issues; the first and most dominant of which is that we as artists live in a culture that doesn't care about what we do, or why. There are always lessons to be learned from other artists, and from other artforms; there have been many artists who have explored the interface, or boundary layer, between the arts, and there have been some particular artists who have been multi-channel artists of note, in some cases of genius. Why more artists don't pick up on this as a role model has always baffled me. The most cogent book on Magritte I've read was by an art historian who actually paid attention to what Magritte said about his own art. 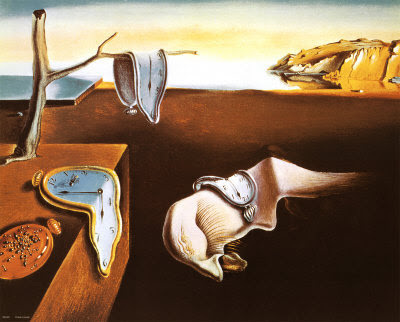 (On the other hand, you can't trust anything Dali said about his own art.) He basically said that he was not a painter, and not a Surrealist, he was in fact exploring ideas in human consciousness and language. His paintings were cognitive illustrations of paradox, possibility, and linguistic analogy. Magritte was the first to say that he lacked painterly technique; but it wasn't his priority to develop it, either, because what he was trying to do was itself not painterly. Seen from this viewpoint, the paintings actually work better, and function as meaningful explorations of what meaning itself is. Looking at Magritte's collected works again from this new light, they all seemed to glow from within, and were far more powerful than ever before. Each one of your posts is researched like a full blown research PHD. I'm looking forward to part 2 - always loved concrete poetry. Very good point, Art, and I suppose in that respect I'm quite lucky; even though I don't paint or compose any more I have and that has affected how I write. Ego is such a detrimental thing with artists, in fact I'm working on a blog about that at the moment so I won't use up all my material here. The thing about different art forms is that even if you don't give them a try yourself you can still experience them or try to. And you're quite right about Magritte. Perhaps if one thinks about him as a graphic poet we might get a little closer to appreciating him. I relate to him quite strongly in that he set his own rules and stuck to them. By the way, I use one of your poems in the next part. Adrian, thank you for that. I do my best. It is important to me that these articles are as helpful as I can make them. I wish I was doing a PHD. At least then I could get away with one 80,000 word blog a year. Getting one of these babies up and running even just twice a week is a bit of a chore at times. The only way I can do it is to work on several at a time and make sure I have a stockpile of about six to fall back on. As for concrete poetry. I've never really got it so I'll be interested to see what you have to say when Part II goes up on Thursday. Concrete poetry is about near-field and far-field focus. In near-field focus, you notice the words, and their meanings, what they represent as words usually do. Then you pull back, or zoom out, to far-field focus and note that they are also just dots of color (black is a color) on the field (the field of the page). The best concrete poems unify both of these fields, and let you move back and forth between them without disruption. The two focus fields also add resonance to each other, by adding layers of meaning (interpretation) that each one alone isn't capable of. Hence the poem about a swan in the outline of a swan. As a graphic designer and typographer, which I was professionally for many years, I often appreciated what they used to call experimental typography, which was type designed to illustrate the content of the passage without actually using artwork, just type. The early Moderns such as the Bauhaus an De Stijl did some very good experiment with this. Concrete poetry actually came later, and again is representational typography on the field of the page, using words, the alphabet, as elements of illustration. The current style of vispo (visual poetry, which is often computer-tooled and sometimes animated) is a direct descendent. Sorry to jump your gun on this topic, but it does naturally lead towards it, I agree. I don’t mean to digress however; I would like to add, especially in the context of vispo, that very few people seem to credit the early explorers of visual poetry. Visual poetry has been around for millennia. It seems that most of the vispo folks think that it started with Apollinaire. The Chinese with have been doing it for a couple thousand years if not longer since the Chinese characters themselves are pictograms. It may be experimental in English but the ideas have been around a long time. On a similar note … Japanese Haiku is nothing like the little metric lines we have constructed, for the Japanese work was visual poetry as well. It is hard for me to recognize English Haiku as really being Haiku at all, for it is missing all of the visual aesthetic. Nicely put Art Durkee. 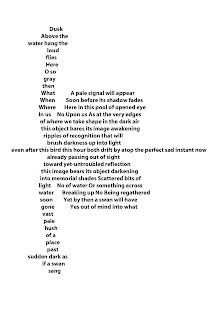 I like the fact Concrete poetry is so visual; shapes and space on a page. And I'm a big typography freak too. Let's see what Jim makes of it! Art, Adrian and Kaz, I think what I need to make clear is that this blog has been a fair voyage of discovery for me. I'm really quite a unadventurous poet. I know what I like and, the odd experiment aside, I tend to stick with it. Also, since this is a blog and not an encyclopaedia article I've really only provided a bit of an overview. I am certainly no expert on any of this and the odds are, in the months to come, I'll return to some of these topics and delve a little deeper. So I do hope you're not disappointed in what comes next. I throughly enjoyed this post! Thank you! Thank you for that, Janet, I'd hoped that a few artists might run into this post. This is a wonderful post. I know that I'm often inspired to write poetry after looking at a beautiful painting, photograph, or just the artistic beauty of the morning sky. Angel, thanks for dropping by. I see from your site you already have a great appreciation of both poetry and art. Loved the photo of the kids on the railway track BTW. Just to counter what Kaz said about haiku, which I partially agree with, I would point out that ideogrammatic writing systems (such as those used by the East Asian languages, Chinese, Korean, Japanese) are not unknown in Western cultural history, either. Western languages have not always been alphabetic, although we have come to think of them that way, because they dominantly are. Hebrew, while an alphabetic writing system, also contains elements of ideogrammatic usage, in that each character's divine interpretation is a visual symbol of something greater lying behind the letter or word. So the Hebrew writing system bridges the distance between text and visual poetry. Qabbalistic studies are rife with these illustrations. I also question how far one can extend the definition of a term like "visual poetry." If you take it all the way, ALL writing are visual poetry, because are visual. I think one has to avoid letting the definitions get so loose and open that they become useless. In terms of English-language haiku, I don't subscribe to the purist tradition of "only Japanese haiku are real" notion; for one thing, there are at least as many bad haiku in contemporary Japanese as in any language the form has been transplanted into. The difficulty with moving the form to other languages is in taking its strictures too literally, and going for the literal rather than the symbolic. 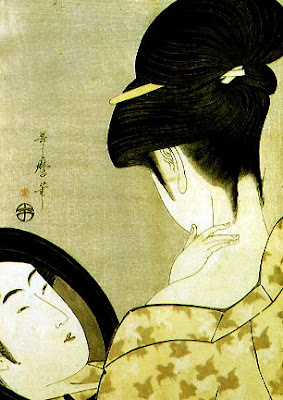 There is a strong tradition of haibun and haiga in English, that is growing continuously. Haiga are paintings-plus-poems; although some artists now use photography and digital art to make the art that is integrated with their haiku. The point is to integrate art and words, not use one to merely illustrate or comment on the other. Haibun is poetic-prose-plus-haiku, and is alive and well. Is visual poetry only eyeball-visual, or can it also be word-paintings? In the latter case, haibun is doing very well in English. Art, stop jumping ahead - there are three parts to this post and we don't get onto haiga till Monday - so save some of your wise words of wisdom for later. Not that, having perused your blog (indeed I quote from it in Part III), you are short of them. Can't help it. I think in clusters, not linearly. Catching up late...interesting post. I love the Miro quotation at the start...'without caution'...yes indeed! "My main thought is that we, in 1999, being so worldly, so informed, so flooded with motifs from the past, find it more and more difficult to allow any object, whether a snowstorm or a toad or a painting, to pass through our subtle chambers to reach the soul. Students in graduate school, even some poets, are taught to linger in these chambers of the mind until they decide to remain there, as "in some mid kingdom dark." 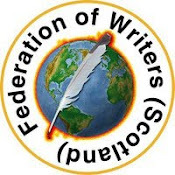 "The job of the writer who knows about these chambers is to give us a frog or a giant or a snowstorm and to protect it from all the invisible forces that want to delay it, elaborate it, relate it to correct opinions, prevent it from arriving at the soul. " You might also be interested in the post (7th August, 2008) on my blog, about Botticelli's Birth of Venus and a poem that arose from it. Yes, I wondered where you'd run off to Rachel. I've gotten used to you being one of the first but at least when you got to it you weren't disappointed. As for the ego thing, an ego is like a dinosaur chained to you - you keep feeding it and it keeps stepping on you (not mine) be glad you don't have one. Dominic, I enjoyed looking through the essay by Robery Bly. I particularly appreciate his listing of the five 'chambers', the 'chamber of dark and light', 'the chamber of memory', the 'chamber of intellect', 'the chamber of practical intellect' and, lastly, the one "at the top of the stair", 'the chamber of spiritual intellect'. Personally I would've added chambers of the imagination and a chamber of the emotions. We respond to things we see and experience in so many way. Poems, in my experiences, are these images processed and refined. Their origins may have been natural but the end result is a product something we sell if we can. I think it's worth reminding people how artificial all art is. Not that 'artificial' is bad. It's interesting what you say in your own blog about your father's experiences. When I first saw his pencil sketch my initial suspicion was that the model was an Oriental; she looks a little short. I have always been so jealous of people who, with a few strokes, can create something so evocative.